How can it be September already? It only seemed like the other day I was trying to work out which 20 books I was going to attempt to read this summer and now the time to complete that challenge is over. It’s been a truly extraordinary summer here in London — the hottest I’ve experienced in my 20 years living in the UK — and I’ve (mostly) loved it, though the lack of air-conditioning, both at home and in the office, has been trying. You would expect that kind of weather would be conducive to lolling about with book in hand, but I found it did the opposite: it just made me too tired to concentrate. Or maybe that’s because work has been pretty full on ALL SUMMER and since May I’ve been doing an additional gig co-ordinating six pages of copy for a weekly magazine. And, to top it all off, I spent three weeks of June studying in the evenings and weekends for my WSET Level 2 Award in wine and spirits, a professional qualification that was a fun commitment but hard work! If I could hand out prizes, I’d give one to John Lanchester’s Mr Phillips for being the WORST book, while I’d give Sumner Locke Elliott’s Fairyland a prize for the BEST book (closely followed by Jennifer Johnston’s This is Not a Novel). The prize for “romp of the summer” would have to go to Sabine Durrant’s Lie With Me, which was such a fun (if crazy) read, while the prize for the most thought-provoking read would have to be shared between Gerald Murnane’s Border Districts and Elizabeth Jolley’s The Well. I hope you’ve had a fun summer (or winter, if you’re in the Southern Hemisphere) of reading. 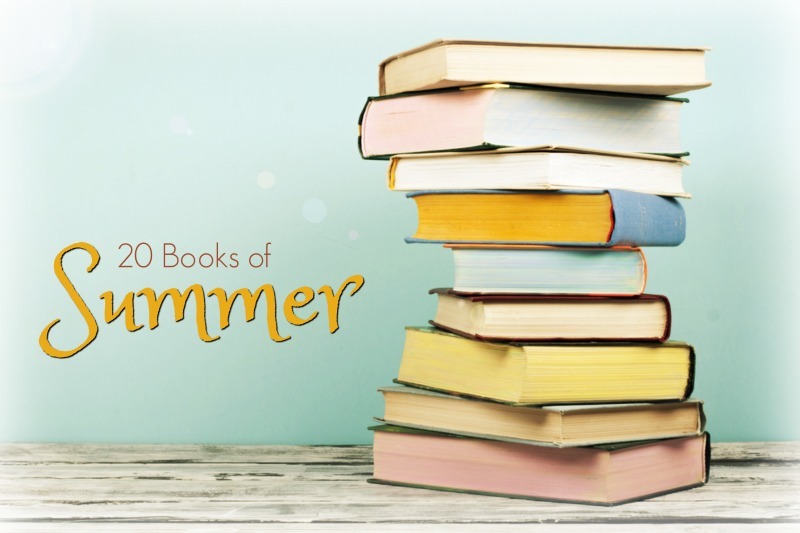 Did you do the 20 books of summer challenge? Did you read anything good? Who would you give your prizes to? PS> Thanks, once again, to Cathy, who blogs at 746 Books for running and championing this challenge. Oh, yes, your job sounds just awful, my heart is bleeding for you, NOT! I was delighted Michelle won: it’s a book that will certainly go on my top 10 at the end of the year. I had fun reading all the MF shortlist nominees, don’t think there was a dud book on it. Well done on 19, that’s quite an achievement and I know that feeling of when it’s too hot even for reading, thats when the body needs cooling down, there’s a limit to how high the body temperature can rise before productivity in any activity takes a dive, I guess that’s why they are the hours of the siesta in those really hot countries with no Aircon. I didn’t participate in this one, but I managed six of eight books I had for #witmonth, reading women in translation, so happy with that. Will check out your reviews for the favourites. I actually thought I’d only read 17 and then realised I’d been miscounting for about 6 weeks! I blame the heat 😉 Congrats on reading so many for #witmonth. I had thought I’d participate in that as well, but it didn’t quite work out that way. Looks like you had a wonderful summer, Kim! Great books you have read! So nice to see Peter Carey, Per Petterson and Kim Scott on your list! I need to read my first Kim Scott soon! Thanks for sharing your summer reading and life adventures with us! Hope you have a wonderful time in September! Thanks Vishy. I’m thrilled the mild weather is expected to last all through September 😊 and will happily keep reading from my TBR, letting whim & mood dictate my choices. Heat enervates me, too, so I wasn’t surprised to read you found it tricky to concentrate. The lack of air was quite trying at the schools where I taught, none of which were fitted with air conditioning. I like how you so efficiently mentioned the best and worst and “romp”; I like how you fell short of the full 20 by just one. I myself read 16, but I wasn’t officially trying to get 20 read. Although I am unofficially trying to get though the Man Booker Prize long list…eventually. Have fun in Basque Country when you get there! Thank you. I’m mildly annoyed I fell short by one but this last week has been crazy at work and I’ve not had time to squeeze in a 20th read, not even a two-hour novella. Oh well. Good luck with your Man Booker reading. I fell out of love with that prize when they changed the rules, but always interested in hearing about any good books that do make the cut. Thanks for taking part! 19 is a win in my book. Look forward to hearing what you thought of Joyride to Jupiter. Cheers for hosting and organising, Cathy. I really enjoyed Joyride to Jupiter… some intriguing little nuggets in there. I liked it too Kim, I’m very much looking forward to her new novel Becoming Belle. Congratulations on (almost) completing the challenge. 20 books is a lot to read and write up even if you were on holidays, and obviously you weren’t. Some Australians there I haven’t tackled yet – looking forward to your review of The Catherine Wheel, I should read more Harrower, but my brother is an Eleanor Dark fan and has me started on Waterway. I ought to read some Eleanor Dark, shouldn’t I? Sounds like you have an absolutely rotten job. Just terrible. Congrats on finishing 19! I read 15, which I thrilled about given how much traveling I did this summer and how lethargic the heat makes me as well. I know my job is the pits! The trip is actually part of an incentive program: the best three students in the WSET course I did in June won a place on it, so I was determined to do well! You might notice that quite a few of the books I read were slim, so while you might have read 15 books your page count probably matched my 19. I read a mixture of slim and long books so it’s hard to say. ‘The Last of the Mohicans’ was such a slog, though, that I didn’t read anything for weeks after finishing it. Well done on finishing 19. I have never done the challenge because I don’t do challenges, except the AWW. You’ve had a great summer – I’d love the heat, though not if it were humid. Was it? Anyhow, you read a great variety of books, most I haven’t read but some are on the TBR. Loved your little analysis at the end. Well, it’s not so much a challenge but an incentive to read books from your TBR, which is what I’ve been trying to do much more religiously since 2015. This year I think I’ve read the sum total of three books supplied by publishers (they tend not to send them to me any more… once upon a time I’d get 40 through the door each week!) and everything else is stuff I’ve purchased, either recently or has been sitting in my TBR for some time. Like you I love heat, but it does get humid in London and because there’s no aircon (except in the supermarket and the occasional pub) it gets very wearing. I went three months without wearing anything longsleeved, which is virtually unheard of here. And while the heatwave is over, it looks like summer hasn’t packed up just yet… forecasters are predicting another six weeks of mild weather… it was 24C here today, for instance, which is just perfect. Yes, reading the TBR is something I’d like to do more of. Two thirds or a little more of my reading is from publishers. I’d like it to be a little less really though I do end up reading an interesting variety. The humidity would be the end of me. It plays havoc with my eczema … I need hot dry summers, mild moister winters … like places on the Mediterranean! 24°C is lovely. It’s been humid, but what kills me is the no aircon — when there’s no relief it begins to feel very draining. Reminds me of childhood in Oz, when the best you could hope for was a pedestal fan. Ah, thank you. Yes, I’m looking forward to reading some newer books that I bought over the summer and put aside until this challenge ended. It’s funny doing qualifications, isn’t it – is yours for your job? I’m trying to qualify as an endurance official (to officiate at cross-country and road races) and have to sit down with my CD rom and do Learning, which is just really hard to get down to!). Great reads, well done. I think Peter Ginna’s “What Editors Do” was a stand-out for me, but nothing was bad as such, which made for a great list for me. “What Editor’s Do” sounds fascinating. As a former magazine sub-editor, I always said my job was to make the writer look good. Fascinating! Yes, that’s pretty well what the book says, although in great detail. Help the writer; help the reader.